From the age of three to four, I had a turntable with a red plastic case that I'd use to play records all day long. 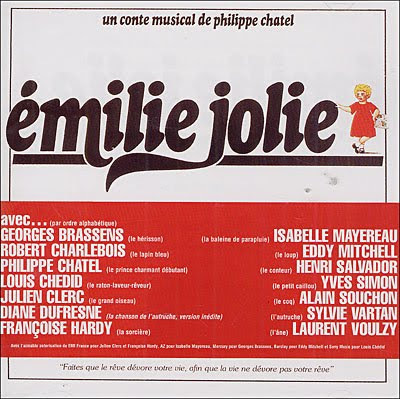 One of my earliest memories is a Philippe Chatel's children musical called "Emilie Jolie" that I'd listen to continuously until I knew the words by heart. I was not gifted with blonde locks and I did not have blue eyes like the lovely Emilie but as with many little French girls, I identified with her. Emilie is basically this little girl who can't sleep at night because she finds herself all alone while her parents are out and she is terrified of the dark. I could readily identify with that. No sooner were the lights out that I had to fight the horrible products of an overactive imagination. The narration is in third person with the narrator also directly interacting with Emilie as she flips through this book merging with each page's content into a magical universe. It's similar to Mary Poppins where the children enter into the park after leaping into one of the chalk drawings but in this case, Emilie is both inside the book and outside it, since she can still flip the pages. For each page, she meets fantastic characters each with a story and a personal song. The first turning point of the story is the meeting with a witch. "Il y a une sorciere dans cette histoire?" (Is there a witch in this story?) asks Emilie. "Dans tous les comtes, il y a une sorciere et un prince charmant." (In every tale, there is a witch and a Prince charming) assures the narrator.
" Faites que le rêve dévore votre vie, Afin que la vie ne dévore pas votre rêve . " Let your dream consume your life. It is a beautiful ending because it reminds the main character, Emilie along with every other child, to grow up honouring their dreams and their imagination. As a child, I did not understand the quote very well but as an adult today, I can see how easy it is to forget one's dreams and to let life, adult life with its adult concerns, its materialistic outlook and other "matters of consequence" take precedence over joyful fantasies. I'm determined not to let it. Personally, I believe you can expect that level of depth from most French children's tales. After the meeting with the witch there follows a quest to find a Prince Charming who will magically turn the witch into a kind, loving princess. Emilie Jolie must flip each page of her book and encounter one character after another asking each if they have at all seen Prince Charming. Of course none of them have but we are treated to their song nevertheless and learn a little bit about each one of them. Each character's song is well written and most are enjoyable. 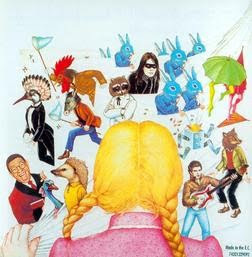 My personal favourite as a child and also today, is "La Chanson du hérisson " (The Porcupine's song). Who has not met a porcupine? A depressed person who sees life through a negative lens and who only wants proof that they are worthy of love. It is easy to be rebuffed (prickled?) by their negativity and it often requires courage to overcome their rejecting ways and give them the proof they ache for. This is the lesson that this song teaches. Oh, how sad is his song. In this book - I actually love this part because it has two meanings. In the first instance, Emilie is answering the porcupine's question, acknowledging that she is the only one who can help him. But at the same time, on a broader scale, she expresses her realisation that her book journey is solitary and that everything so far, has been a product of her imagination, or a reflection of herself. I love this. Emilie est allée caresser le hérisson ! Emilie has gone to caress the porcupine! Elle a caressé la chanson ! Mais non, le hérisson ! Here's the song, in case you want to sing along!